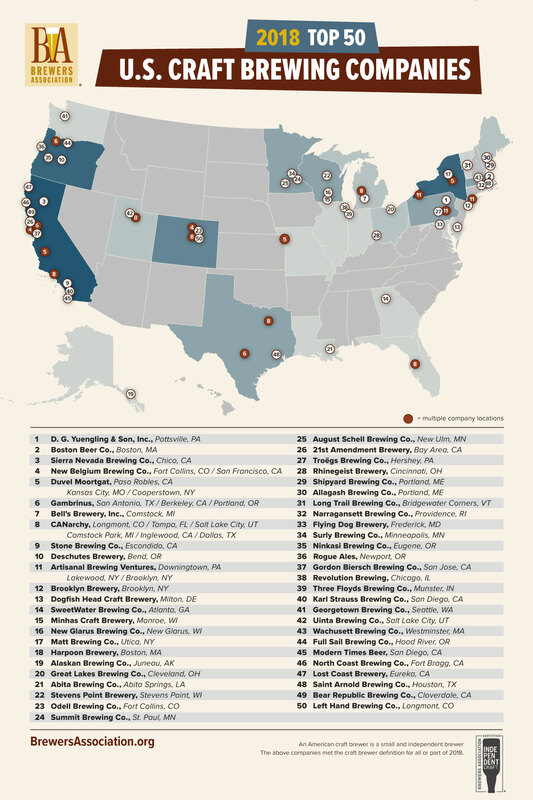 View and download map of top 50 producing craft brewing companies. (1)Figure based on companies that met the craft brewer definition for all or part of 2018. An American craft brewer is a small and independent brewer. Small: Annual production of 6 million barrels of beer or less (approximately 3 percent of U.S. annual sales). Beer production is attributed to the rules of alternating proprietorships. Independent: Less than 25 percent of the craft brewery is owned or controlled (or equivalent economic interest) by an alcoholic beverage industry member that is not itself a craft brewer. Brewer: Has a TTB Brewer’s Notice and makes beer.